Visit https://electoralsearch.in/ to see if you are registered to vote. If your name appears in the list, you are eligible to vote, otherwise you need to register to vote. Visit https://www.nvsp.in/ for voter registration. Also, you can use Voter Helpline App to verify your name in Electoral Roll or register online. Please fill Form 8 (Link to online form) for any change in (Name, Photo, Age, EPIC Number, Address, Date of birth, Age, Name of relative, Type of relation, Gender). In case of shifting from one place of residence to another place of residence within the same constituency please fill Form 8A (Link to online form). have attained the age of 18 years on the qualifying date i.e. 1st of January of the year of revision of electoral roll. are ordinarily resident of the part/polling area of the constituency where you want to be enrolled. are not disqualified to be enrolled as an elector. 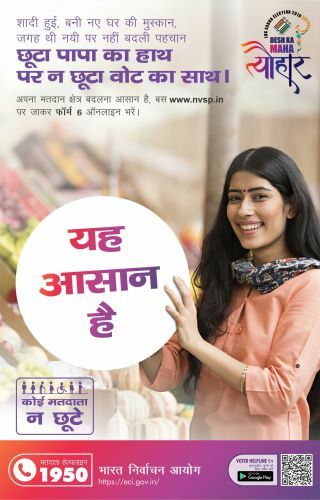 If you meet the above criteria please download Voter Helpline App or visit nvsp.in to register online. You can also enroll offline. Fill two copies of Form 6.This form is also available free of cost in offices of Electoral Registration Officers / Assistant Electoral Registration Officers and Booth Level Officers. The application accompanied by copies of the relevant documents can be filed in person before the concerned Electoral Registration Officer / Assistant Electoral Registration Officer or sent by post addressed to him or can be handed over to the Booth Level Officer of your polling area. Call 1950 for any help (Please add your STD code before 1950). For more information read the Voter Brochure on http://ecisveep.nic.in/.